Home » Foreign Bride » InternationalCupid, Finding Foreign Romance? For those of you who fancy a hot romance with someone in a faraway country, InternationalCupid is there to help you. It’s one of those dating websites set-up especially for people wanting to date across foreign borders. So if you like the sound of a beautiful Russian wife, or fancy the idea of a seductive Latin girlfriend, read on. InternationalCupid works both ways for men and women naturally. Even so, many, but not all of those who want to leave their country are young, pretty women. One thing to keep in mind though, this website is not a marriage agency. 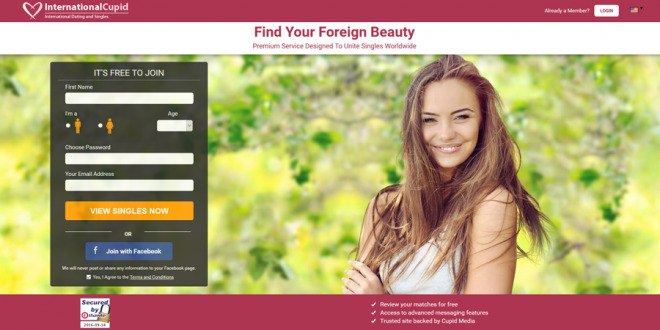 Unlike foreign bride websites, InternationalCupid doesn’t play any part at all in the matchmaking activity other than providing a platform on which people can communicate. I’ve met an awful lot of people who join dating sites, but seriously under-use them! With this arrangement, the website’s one hundred and fifty thousand or so international singles can chat and get to know each other within an open and welcoming cyber dating zone. What I liked about InternationalCupid was the way it takes the pressure off of dating. It makes the whole situation as easy and none-threatening as possible. As if dating “a local” wasn’t hard enough, romancing someone from an entirely different culture brings on a whole new set of challenges. Once you join up, you don’t have to worry about time-commitments, buying extra stuff, or your credits expiring like you do on other sites. What’s more the simple 3-Level membership plans are explained in a crystal-clear way so you know exactly what services you’re entitled to use. Everyone starts off on the free standard account, and you get to decide if it’s worth going up a level or two and becoming a fully-fledged member. I didn’t find any difficulties with the free starter account. One thing I do advise though is to get the hang of the site and understand precisely how it works and what it can do for you. I’ve met an awful lot of people who join dating sites, but seriously under-use them! Usually it’s simply because they don’t make the effort to learn the platform beyond the basics. It’s sad because these people never actually get the most out of their online efforts. And usually these are the ones who end up complaining that the website didn’t help them or even misled them in some way. There’s a lot of features on Cupid sites, and this one isn’t any different. This stuff is there to help you and improve your chances of meeting someone you really click with. In addition there’s a mass of resources available for those who’re serious enough to take the plunge and marry their long-distance sweetheart! It seems a bit strange to me that InternationalCupid is one of the few sites that concentrates on bringing people together from any country. Most websites are centered around certain territories or regions, Latin America for example. This site isn’t limited to Russians, Czechs, Brazilians or any other people of a specific country. It’s open to all. I was surprised these girls couldn’t find any respectable men in their own areas – given that most had stunning model-like looks. What I found though were lots of Eastern European women. When I checked into their detailed personal pages, most of them were young, successful professional women. I was surprised these girls couldn’t find any respectable men in their own areas – given that most had stunning model-like looks, with flowing hair and beautiful complexions. I got talking to some of these hotties in the chat areas because I was so intrigued. Irina, a 27-year old beauty salon worker told me “most of the men in her town were alcoholics or jobless”. She had one son and just wanted a better life with better prospects somewhere else. The above table is based on my survey of users. Because InternationalCupid is such a mixed bag, you need to make certain you get your personal profile in order. I say this, just so that you don’t get mistaken for a faker or some other individual who isn’t supposed to be there. Nowadays, even girls from poor countries can be the target of scammers. Make sure you don’t come across as someone with nefarious intentions. Tip • If you’re male, and interested in meeting a female from one of the ex-Soviet countries (or other developing lands for that matter), I have a few recommendations. Show your emotional side: Put in a good few paragraphs in your profile’s written area to describe yourself at an emotional and spiritual level. Do this as well as offering plain facts. Many Eastern European girls are curious about oddities like astrological signs and other mystical phenomena. Silly it may sound but talking about this sort of stuff can make you seem intriguing. Responsibility: If you’re employed, tell her. It’s worth pointing-out that you’re financially stable and responsible. If you own your own house or flat, definitely mention that. Tell her you’re sober and drug free. Hopefully you are!. Boasting about drinking binges, even if joking, will get you sent straight to the trash pile. Family: Say something about your family values, your background and likes and dislikes. Women from this part of the world have strong family bonds and expect the same in their husbands. Women from these ex-communist countries also take great pride in their appearance. Even when they’re extremely poor, they will be immaculately turned-out. They’ll often spend a relative fortune on getting makeovers and professional photos done so that they can appear their best. Hint • They expect you to do the same! Not the makeover part! You don’t have to get an expensive studio shoot, but just make sure you’re smart and well presented. I’ve spent a lot of time in this part of the world, and I know precisely how the girls think. Even though times are changing, the women there are still inclined to be more traditional in their mind-set. Especially away from larger cities. If your pictures show you unwashed and unkempt, even if that’s your style, you could be dismissed as the local homeless guy or a vagabond! Romances with people from different cultures are never plain sailing. I know, I’ve had a few of them myself! What they offer though is excitement and fascination. Times have moved on and people’s attitudes have changed. A lot of the bureaucracy and red tape that hindered foreign marriages in the past has now been lifted. So there’s never been a better time to do this. If this is for you, InternationalCupid does give one of the safest and best choices for your search for a foreign wife or husband. The monthly membership, even if you used the site for years-on-end, would still be far less costly than going to a marriage agency. Summary : Use InternationalCupid if you're serious about finding a foreign wife or husband. It doesn't matter where they are in the world. That's why it's "International"!